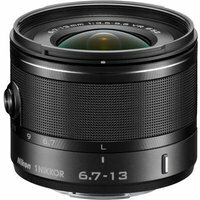 The Nikon 6.7-13mm f3.5-5.6 VR 1 Nikkor Black Lens is a compact, ultra-wide angle zoom lens with a Vibration Reduction (VR) function that delivers high-resolution images from an ultra-wide angle. The lightweight 6.7-13mm (18-35mm in 35mm format) lens weighing in at just 125g is easily portable on your travels and is great for landscapes, architectural work, portraits and group shots. The Vibration Reduction ensures minimises blur and helps reduce camera shake when shooting in dark locations. Its metal design and glossy finish matches the body of a Nikon 1 perfectly.